The cylinders on these 4 in 1 Combination Buckets have a 2.5" bore by 8" stroke. 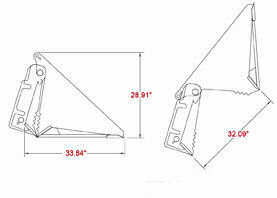 The buckets also come equipped with a 1” x 8” cutting edge and 3/4” x 6” at all other ground engaging points. They are also built with top quality steel, oversized points and bushings and with grease fittings at every pivot point. Every unit exceeds the lifting capacity of the skid steer machine it is used on.